without even putting on pants. Experience the largest Evolving Out Loud live event yet, with over 3,000 people shedding old stories, connecting to their hearts, and rising to a new place of infinite love and possibility. 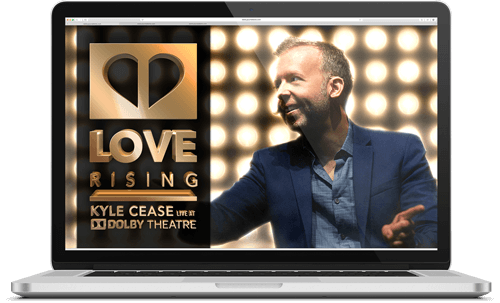 Love Rising: Kyle Cease Live at Dolby Theatre was filmed in July 2018, in Hollywood, CA. Be a part of weekly live interactive video calls with Kyle. Get access to every online course we have ever made (or ever will make). Join a community of world changers. Watch absolutely everything in your life shift into a new dimension. The Limitation Game: Interactive is the full footage of a 2-day Evolving Out Loud live event PLUS additional one-on-one videos with Kyle, extra exercises, and bonus never-before-seen footage… It’s over 12 hours of immersion into a way of being that could completely change your life. 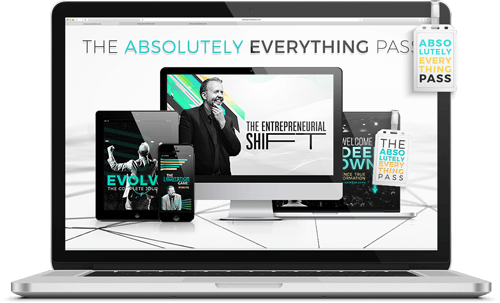 The Entrepreneurial Shift is a paradigm-shattering video series for entrepreneurs, CEOs, employees, elevator repairmen (or women), and really, anyone who is wanting to mine their deepest potential and truly make an impact in the world. Over the course of 21 days, Kyle shares experience and personal insights that will help you raise your perspective and allow you to identify new resources, opportunities, and assets that have been hiding dormant within you and your company. EVOLVE: The Complete Journey is the ultimate way to deepen your personal evolution. To begin your journey, it includes the entire video series of The Limitation Game: Interactive 2-day live event, and continues with 19 additional daily coaching videos from Kyle, to transform your life—completely. Except for the stuff you like. You can keep that. Welcome to Deep Down, filmed at a 1,400-person Evolving Out Loud live event, is a video series that will help you identify and remove the illusions that have been keeping you from being happy, right now. Within 2 full days of content and interactive exercises, watch Kyle work one-on-one with audience members to help them move past their old stories and into a new vision of what is possible in their lives.